Front Row: Louis Walker Poteat (1898-1971); Robert Linwood Poteat (1909-1982); Erma Minerva Poteat Conner (1906-). Middle Row: William Banks Poteat (1900-1967); Albert Lindsay Poteat (1865-1929); Minerva Ann Fitch Poteat (1873-1943); Isabella Poteat Foster (1902-1990). Back Row: George Albert Poteat (1894-1947); Cornelia Elizabeth Poteat Davis (1896-); Frances Lindsey Poteat Ebbs Hobbs (1892-1969). 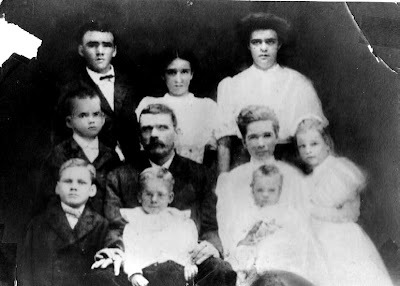 Additional children of Albert Lindsey Poteat and Minerva Ann Fitch Poteat not shown: Fletcher Fitch Poteat (1904-1969); Walter E. Poteat (c.1910-); John Clay Poteat (1912-1982); Mary Moye Poteat Cheek (1917-2000).